The FA’s Respect programme was launched in the 2008-09 season following a build-up of behavioral problems in the National Game. 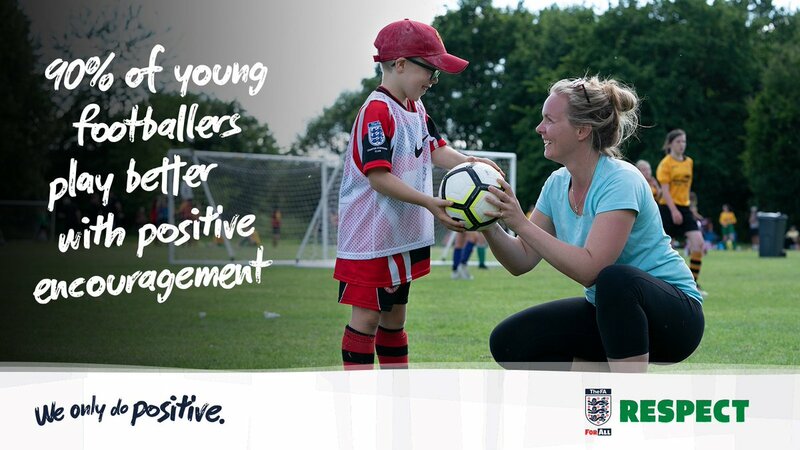 The new FA campaign ‘We Only Do Positive’ is targeting coaches and parents within mini-soccer and youth football. A new strategic approach to the FA Respect programme will see us focus on this important area of the national game over the next three seasons. In 2017-18 The FA carried out extensive research in to football from U7s–U18s. This was to understand where Respect should be positioned to have the biggest impact over a mid to longer term approach. One clear piece of insight highlighted is that 9 in 10 children play better with positive encouragement. Research also highlights the negative connotations a negative experience can have on a child. ‘We Only Do Positive’ aims to promote and educate coaches and parents on their roles in creating a fun, safe and inclusive environment for all the players, ensuring they have great experiences throughout their football journey. © 2018 Tigers Junior Football Club. All Rights Reserved.